Through an integration of genomic and proteomic approaches to advance understanding of long noncoding RNAs, researchers from Harvard Medical School investigate the function of the telomeric transcript, TERRA. By identifying thousands of TERRA target sites in the mouse genome, they demonstrate that TERRA can bind both in cis to telomeres and in trans to genic targets. They then define a large network of interacting proteins, including epigenetic factors, telomeric proteins, and the RNA helicase, ATRX. TERRA and ATRX share hundreds of target genes and are functionally antagonistic at these loci: whereas TERRA activates, ATRX represses gene expression. At telomeres, TERRA competes with telomeric DNA for ATRX binding, suppresses ATRX localization, and ensures telomeric stability. 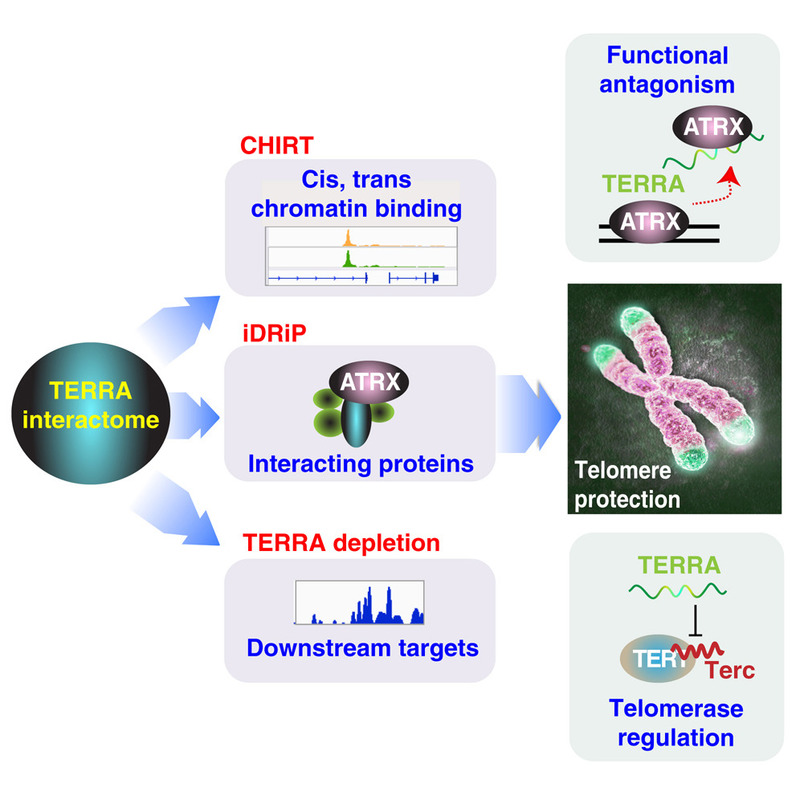 Depleting TERRA increases telomerase activity and induces telomeric pathologies, including formation of telomere-induced DNA damage foci and loss or duplication of telomeric sequences. The researchers conclude that TERRA functions as an epigenomic modulator in trans and as an essential regulator of telomeres in cis.